He said: When is our next massage? And how do we find Thai massages in Denver? She said: Have I mentioned that I’m HOT!? No, NO…I mean the heat! Sheila went to China many years ago to teach English for a summer, but this was our first trip to Asia together. We were there for 5 ½ weeks and it was an experience-rich adventure for these two romantic travelers! There were also some drawbacks, so we’ll present it all and let you decide. We planned our trip around our sailing group’s catamaran charter in early April. Later we learned that April is the hottest month in a region that is already hot most of the time. Having spent loads of time in Florida, Arizona and various tropical locales, we thought “no problem”. Wrong. The coastlines and islands are stunning, while the cities are bustling and packed with people. Nearly everything is a terrific bargain – food, lodging, local transportation, laundry, clothing, souvenirs, and especially massages. The people are very friendly and polite. Generally, they go out of their way to help. Khao Lak for a beach resort and diving, Phuket for a beach resort and island sailing, Chiang Mai for local culture and to volunteer at the Elephant Nature Park Sanctuary, Cambodia to visit ancient temple ruins, and Bangkok for international flights and culture. …AND 10 different lodgings: including sailboats, tiny charming inns, fancy resorts, live-aboard dive boat with bunk beds, and rustic camp style room over a workshop…AND 10 flight segments (6 travel days), and a variety of transportation modes: tuk tuks, long tail water taxis, sailboats, dinghy, taxi, tractor, farm truck (on top of a pile of corn), mini-van, walking and fins. We love to scuba dive (especially Sheila, the mermaid). Thailand is famous for excellent diving so we looked for opportunities near Phuket and found that Khao Lak was the place to be. We reserved 2 spots with Wicked Diving aboard the MV Mariner and joined 18 other guests from around the world for a 3 day, 3 night, 9 dive adventure in the Andaman Sea 60 miles off the coast of Khao Lak among the Surin and Similan Islands. The price was only $550 per person including all the diving, rental equipment, bed and meals. This is serious diving for serious divers – all you do is dive, talk about diving, eat, and sleep. Turns out that Wicked Diving is a wicked awesome dive outfit! Very qualified dive staff, beautiful dives and fun new friends. Read more: Photos, videos and story about Khao Lak, Wicked Diving and our first Thai massages! After our wicked diving trip and before sailing, we met up with our sailing friends for 3 days at the luxurious Amari Phuket Resort, just south of Patong on Phuket Island. We had a great time exploring, planning and provisioning. Then, our 4 chartered catamarans set sail! The scenery is otherworldly – picture scenes from James Bond’s “Man with the Golden Gun” – bizarre limestone islands, cliffs, and caves. There were many challenges with some boat maintenance issues, extreme tides, boat traffic, crowds, tummy issues and heat. Overall, we had great experiences and we always have fun with our sailing friends. For the divers among us, we arranged a private group dive in Phi Phi Don with PP Aquanauts. One major highlight was a sighting of a 15 foot baby whale shark. That was a heart-thumping experience! Read more: Photos and story about Sailing and Phuket. Friends invited us to join them for a visit to Tiger Kingdom, a facility that lets you get up close and personal with young tigers aged 2 years old and younger. We were leery for several reasons, including having read articles that screamed “exploitation, the animals are mistreated and drugged – don’t support them!”, but other friends had been there and raved about it. We chose to see for ourselves. Read more: The controversy, photos, story, and an awesome video of tigers playing in the water! Angkor Wat is a UNESCO world heritage site in Siem Reap, Cambodia famous for being the largest religious complex in the world. There are dozens of temple ruins in the Angkor Wat complex. We focused on three – Angkor Wat, Bayon – famous for large faces carved into each of the many towers, and Ta Prohm which was used as a movie set for Lara Croft, Tomb Raider and is famous for the large trees whose roots have overtaken it. The temples truly are breathtaking in size and detail. Read more: Photos and story about Angkor Wat, Ta Prohm, Bayon, lovely V & A Villa, outstanding Cambodian Circus, unique New Year celebrations and Visa tips. Thai New Year was in full swing when we arrived. They celebrate with Songkran, a tradition in which everybody soaks everybody else with water buckets, water guns, and hoses. It doesn’t matter who you are, you will get soaked – and it’s VERY FUN!! We posted a video in the full story. *Doi Inthanon National Park – with stops at the highest point in Thailand, 2 waterfalls, the King’s and Queen’s pagoda with beautiful gardens, a lunch stop, a hill tribe, and a farmer’s market. *Temples, temples, and more temples – Chiang Mai has over 300 temples. You could easily spend months exploring the history and nuances of each. We visited Doi Suthep, high on the mountain and several within the old city center. *The Karen Long Neck hill tribe and The Bai Orchid and Butterfly Farm – You’ve seen the National Geographic photos of the beautiful women and girls with heavy metal coils around their necks, wrists and ankles. Do you know why? *Street markets and street food – Much to Tom’s chagrin, Chiang Mai is a street shopper’s paradise. Fortunately, the yummy street food, cheap beer, and plenty of $5 / hour foot massages made it more than tolerable for him to tag along. *The Chiang Mai Cabaret – Loads of good fun with ladyboys wearing Vegas showgirl outfits, lip synching and dancing to pretty well choreographed numbers. Read more: Our Chiang Mai story includes more photos, videos and details about these experiences, plus our hotels – De Chai Colonial and Ruen Come Inn. About an hour north of Chiang Mai, is a true sanctuary for abused, abandoned, injured and retired elephants, plus rescued dogs, cats, a herd of water buffalo and a few horses. Our experience was rewarding, inspirational, educational, fun, exhausting, and a bit frustrating at the same time. We thoroughly enjoyed our time with the elephants. We learned a lot and really felt like we were making a difference in their well-being or at least in easing the enormous work load of the staff. Most of these elephants were rescued from a life of physical abuse or neglect – many are blind or injured (some from land mines). Some are gentle and friendly, others are a bit crazy and you keep your distance. As volunteer workers, we shoveled poo, cleaned enclosures, shoveled poo, unloaded trucks full of melons, prepared their food, cut corn stalks, schlepped corn stalks, shoveled poo, loaded banana trees into trucks, and shoveled poo. We also got to feed elephants, “bathe” them by throwing buckets of water on them in the river and just be witness to their antics and personalities. Without question, ENP’s commitment to animals is passionate, full on and making a huge difference in Thailand! BUT, we feel strongly that there are some simple, yet important issues that ENP needs to address as they grow and continue to invite volunteers and visitors to support them. Read more: Photos, videos, lots of trip details, and our insights. We only planned a little over a day in Bangkok. We chose a boutique hotel called Inn A Day with views of Wat Arun across the river and within easy walking distance of the Grand Palace and Wat Pho. We toured both of those and also walked to the flower market and took a tuk tuk to Chinatown for dinner. Read more: Photos and story of our visit to Bangkok. We enjoy massages when at home, but in Thailand and Cambodia, we were massage gluttons. In our five weeks, we each had well over a dozen massages of various types – with some sessions lasting up to 3 hours. We had foot massages, thai massages, yoga massages, oil massages, body scrubs, facials, mani-pedis, and happy-ending massages (JUST KIDDING! Got your attention). Looking back, we should have made time for more! The standard way to get around is the tuk tuk – basically a motorcycle pulling a covered chariot for up to 4 people. 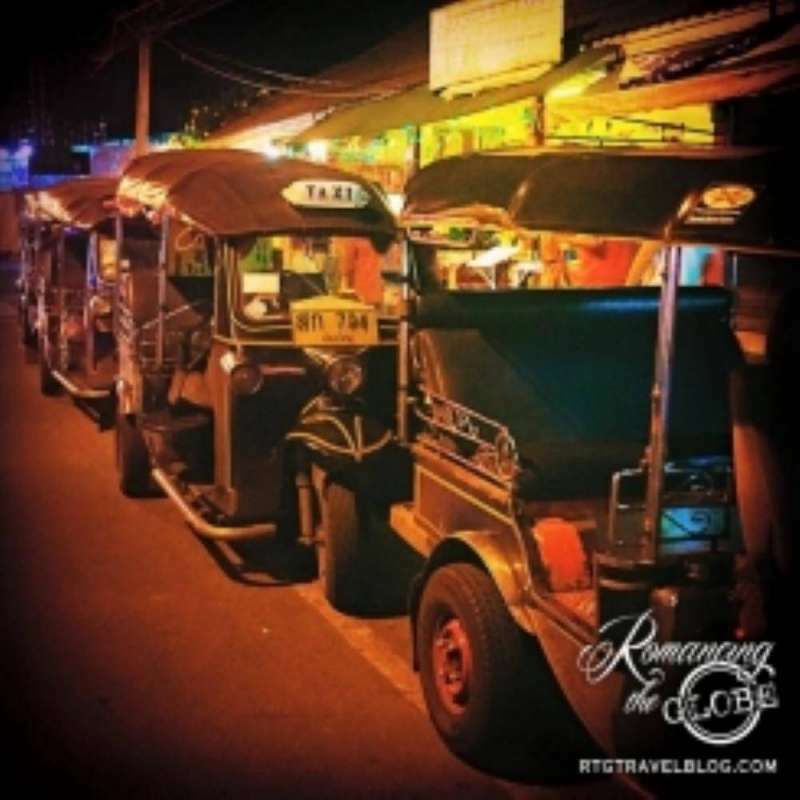 We used taxis or vans for cross country travel, but always used tuk tuks to see the various intra-city sites in Patong, Chiang Mai, Bangkok, and Siem Reap. After watching the crazy drivers and traffic patterns from the back seat of the tuk tuk, we wanted no part of attempting to drive– there’s no way we would rent a car or a scooter here. In Cambodia, our hotel arranged a tuk tuk and driver to take us to the various temples all day for only about $15 (total, not per person). It was the perfect way to see them – and our drivers spoke enough English to understand our preferences. They parked outside each temple and waited for us. In addition to a tip we treated them to lunch near Ta Prohm. Tuk tuks were our rides to and from the airport in Cambodia – definitely a challenge with 6 people and luggage. Rain would have been a bummer. Most tourists are from Europe and Asia, there are very few Americans. Many locals we met assumed we were British. We’re not quite sure what to make of the giggle or the “aaaah” that followed when we said we’re from Colorado, USA. For napkins at restaurants, it is common to see the equivalent of tissues or toilet paper. Public restrooms are a crap shoot (sorry). Sometimes a lovely ceramic hole in the ground with a platform for your feet, sometimes a western style toilet or a variation. Toilet paper is not guaranteed, and when available it is not to be flushed (use the trash can). Usually there is a flexible hose with a spray nozzle to clean yourself (floors were consistently wet). Heat – The area is hot and humid and April is the hottest month. Don’t visit in April…just don’t. Tummy troubles – Expect tummy trouble, even with taking precautions to drink bottled water and avoid ice. The standard advice is to avoid street food, but we can’t recommend that – it’s worth the risk. Just bring lots of Immodium. Niceness – Thai and Cambodian natives are nearly always friendly and polite – sometimes too nice. Culturally, they are taught not to say no. So, when you ask if there is a table available, they will say yes even when there isn’t one because they don’t want to disappoint you. If a mean elephant is approaching, they might say “this elephant is a little unpredictable, we should probably move along”, when they should say “Danger!! Get your butts out of here! !” The exception to this seems to be at the Grand Palace. One of our friends was boldly insulted by an employee who thought her clothing (which had been added and approved by the temple staff) was still “disrespectful”. In Thailand, you can stay in 4 and 5 star beach resorts for just over $100 per night. These resorts would easily be several hundred dollars more per night elsewhere. Very decent rooms for well under $100/night are also available. No carpeting or rugs – everything is tile or hardwood. Your feet start to notice the lack of cushioning after a while. Shoes off – take your shoes off outside of most establishments, not just temples. Drinking water – drink bottled water only. It’s easy to find, sealed and cheap. Non-Smoking – we were pleasantly surprised to see smoking banned in most restaurants, public buildings, and transportation. Employees in the service and travel industry all seem very young. Especially at airports, the check-in personnel and flight attendants looked like teenagers, but very efficient and friendly. Crowds – the most famous tourist attractions are generally very crowded and we were not even there during high season. At places like the Grand Palace and major temples, we expected it and were advised to arrive early. But we did not expect to see hordes arriving on tour boats at some of the beautiful islands on our sailing route. Ladyboys – Thailand has much more acceptance of trans-genders, and cross-dressers than the western world. This wasn’t just true on the main “party” streets. Ladyboys often work as wait staff, hostesses, massage therapists, customer service reps, tuk tuk drivers, and other service industry jobs. Safety – We felt safe everywhere we went – no problems. Sometimes a tuk tuk driver would try to overcharge us so we learned to negotiate the price ahead of time, just so it wouldn’t be outrageous. It’s also really helpful if your hotel tells you what the standard tuk tuk rates to various distances should be. Scams – There are lots of warnings about scams, but we didn’t experience any…unless you count the sellers in the markets insisting their items are handmade by them and their family. I actually believed this until I’d been there long enough to see the same items in multiple booths with very professional packaging. Most scams seem to be aimed at men in the night club scene or tuk tuk drivers taking passengers to their buddy’s stores instead of their destination or the really weird one about telling you the temple’s closed today. Some temples posted clear warnings about pickpockets. In Thailand most places only accept Thai Baht money. In Cambodia everyone accepted US dollars. Spirit Houses – Nearly every home and business has some form of a Spirit House on their property. Usually, they’re shaped like a temple, up on a pedestal, quite ornate and very prominent. You often see gifts of fruit, water, and candles…and coca cola. Even taxis and tuk tuks have a display on their dash. In both countries we saw full families of 3, 4, 5 and maybe 6 people on one small motorcycle! 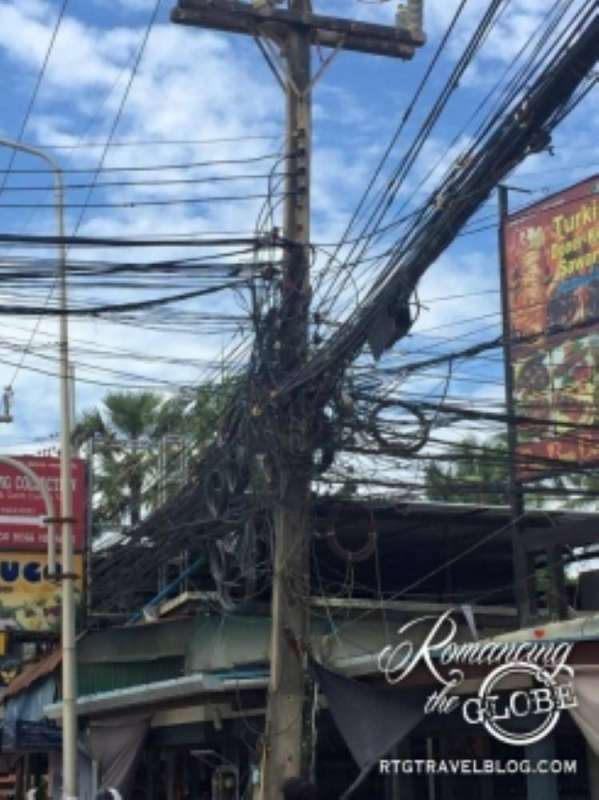 There are apparently no rules to the stringing of electrical and telephone wires throughout the cities. It all looks like an eyesore, and probably dangerous, but it also appears to work. This trip was packed full of adventures and encounters that we may never experience again! If we were to have planned anything different, we’d have scheduled more SCUBA diving, snorkeling, and (you guessed it) more massages. Trip Date: March-April 2015 – Trip stories include Thailand and Cambodia Overview, SCUBA Diving, Tigers in Phuket, Bareboat Sailing for 10 days, Temple ruins in Siem Reap, Volunteering with Elephants, Chiang Mai and Bangkok.
? 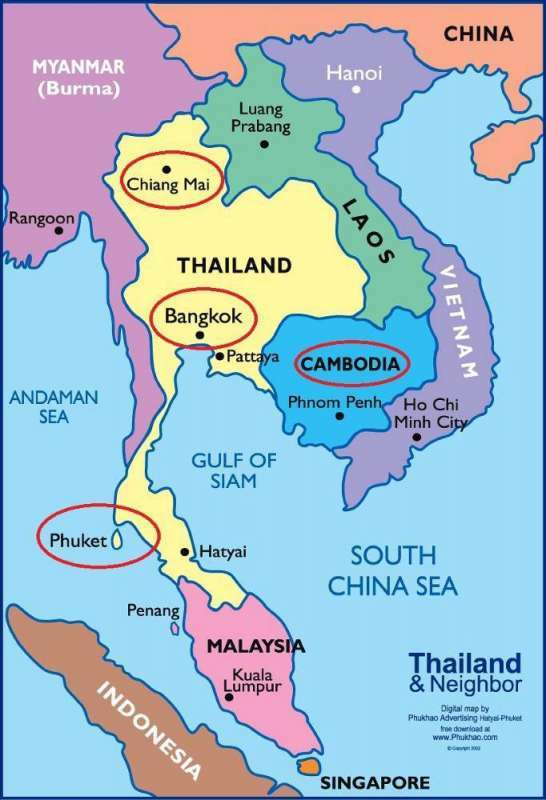 Tell us about your experiences in Thailand and / or Cambodia! Which of these activities would you have enjoyed?